Suneden was the first Special School to open in South Australia in 1943. 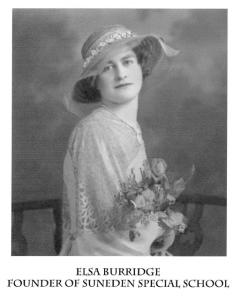 Elsa Burridge founded the school at the age of 27, a fiercely independent South Australian woman who took it upon herself to educate children who would have otherwise been unable to access mainstream education. Rather than waiting for government provision of education of students with disabilities, she began to educate three children herself in the Madge Memorial Church Hall in Halifax Street in Adelaide. Elsa taught children in a small room at the Halifax Street church hall, and as she did so, the sun would come streaming into the den. It became affectionately referred to as the “Sunny Den”. The name then later grew into the name we now are so proud of … “Suneden”. As the numbers of students increased, Elsa outgrew the space in the “Sunny Den”, so in 1954 she bought a house in Killicoat Street in Unley for the school to move to. There was not enough money to pay for the house, so Elsa would teach by day; and by night, she would ride her bicycle to clean factories in order to keep the school running. A real labour of love. In 1966 the School moved to Mitchell Park, where it has been for over the last 50 years. In the early days Suneden educated children from 3 years of age on site as well as accepting children with multiple disabilities, something which it proudly continues to do. A number of Principals followed Elsa’s lead of being pioneering and inspiring. 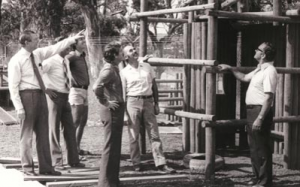 In the 1970’s Suneden was innovative in bringing to life ideas from Europe and America with Bob Topsfield creating an Adventure Playground on site. At Suneden Specialist School the future is looking bright indeed.